Talking about memes is kind of like talking about punk—the more you say the word, the faster your authenticity plunges. But there’s no better way to nosedive your brand’s bona fides than to co-opt a meme and make it the center of your next marketing campaign. 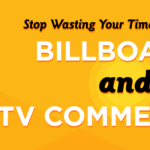 Well-meaning marketers keep making the same mistakes over and over again, and I don’t know about you, but I’m personally so done with seeing stale, lifeless content in the sponsored sections of my feeds. 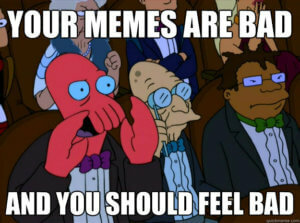 A quick recap: Memes are a cultural element that we see repeated and imitated over and over again. The ones that I’m focusing on are often absurd, ironic, tongue-in-cheek, and yet somehow manage to be communicative, relatable, and overwhelmingly ubiquitous. As a member of that elusive twentysomething segment, I’m totally guilty of being about as cliche as you can get. Meme-based accounts are about 80% of my Instagram feed, I am fully subscribed to the terror of not knowing about the latest meme trend, and I’m at the point that I’m communicating with friends through dumb pictures way more often than I’m messaging real text. With all that steady engagement, it’s pretty hard to not want to capitalize on memes as a marketing channel. So why does meme-based marketing bring the cringe 99% of the time? There is SO much wrong with this post, but let’s start with the most glaring issue. The Barber meme, which this seems to be referencing, is a format used to drag a picture of someone’s haircut, but there’s no mention of hair whatsoever. 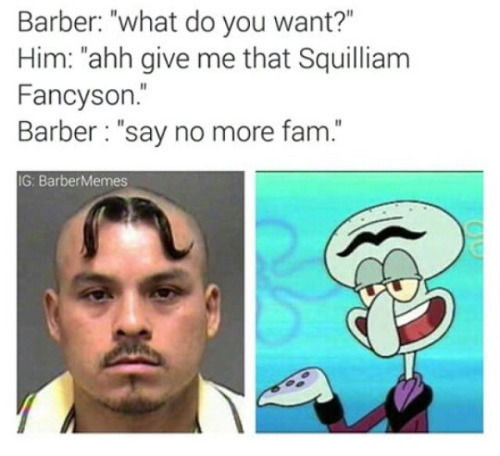 You have the meme’s signature “say no more, fam” but there’s no image-based punchline, making this post, confusing, oblivious, and funny only in a “we’re laughing at you” sort of way. Not even touching the fact that this meme was #hot in 2015. Why are you meeting your barber for lunch? What does this do for your brand, McDonald’s? If you remember one thing from this article, it’s that you should never post something without understanding its context. #WhyIStayed became a popular hashtag on Twitter as a way of defending domestic abuse victims post-Ray Rice scandal. This was the perfect hashtag to further the discourse on abuse. You know what it wasn’t good for? Hawking pizzas. I’m embarrassed for you. You ever have a moment in fourth grade when you have a bunch of friends over, and your dad wanders in from the kitchen and obliviously says something with a “hip” slang word in it to prove that he’s still “with it?” This is what I think of whenever a brand tries to add the word “lit” to one of its campaigns. Or bae. Or whatever trend-du-jour you’re bandwagoning on to about 6 months too late. If Gretchen Weiners was never able to make fetch happen, then I can guarantee you that the Upper Oakville Shopping Centre is not going to get Spring Woke to catch on. WHAT DOES THIS MEAN? It’s like someone took a hipster word generator and created an entire campaign from it. 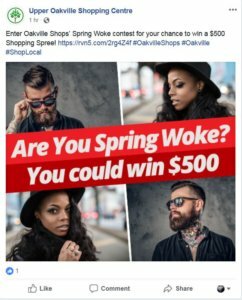 Am I spring woke? I have no idea, but I certainly hope not. If we’re going to be totally fair, this is probably the least offensive of the bunch. Unlike the other examples, there’s no harsh misunderstanding of what Olive Garden is referencing here. So why does this pitch fall so flat? Because no one wants to imagine that the voice of Olive Garden sounds like an overly-excited, 17-year-old girl. I can manage having a Cosmopolitan or Buzzfeed article “literally can’t (or can) even-ing” at me, but I’m not going to accept it from a chain Italian restaurant. Inconsistent brand voicing is a surefire way to leave your customers scratching their heads or feeling uncomfortably pandered to. So, are there any examples of companies successfully capitalizing on #memeculture? Denny’s diner should not be leading the meme game, but this is the internet where everything’s made up and the points don’t matter. America’s Diner has created a visual and communicative aesthetic that capitalizes on millennials’ penchant for absurd humor but is crafted with such originality and nuance that you don’t feel like you’re being sold to. Just glancing through their Twitter and Instagram feed, you might think that the company has absolutely lost their collective mind, but there’s something about it that reeks of authenticity…even though in reality it’s highly calculated. At the end of the day, the biggest takeaway is that millennials do not want to feel like they’re being marketed to, but they do want to add value to their life (like a sweet, toast-related pun). If your focus is more on exploiting trends for your latest campaign than it is finding your relevant markets and creating something the audience can benefit from, don’t be surprised if you get sniffed out miles away. If you’re a marketer, there’s nothing more ineffective than shoehorning slang into your posts, or co-opting meme trends that are totally unrelated to your product. If you create a tone-deaf, pandering campaign, you’re opening up yourself (and your brand) to become the internet’s latest laughingstock or, even worse, being subject to its rage. The key to the jaded millennial heart could be a well-executed meme, but with so many variables, it’s probably best to leave abject absurdity to the internet hive mind, where it belongs.